Cinque Terre Italy, five pieces of World and beauty. Cinque Terre Italy, meaning "The Five Lands", five pieces of world, but one beauty, an experience where the generosity and perfection of nature is living harmoniously with human intervention. 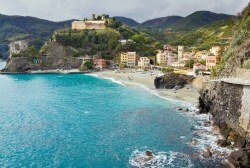 The charm of the five villages of Corniglia, Manarola, Monterosso al Mare, Riomaggiore and Vernazza leaves its mark even on the least attentive visitor. 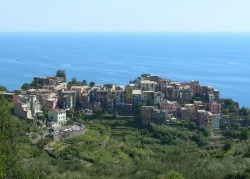 The five villages, the coastline and surrounding hillsides are all part of the Cinque Terre National Park and since 1997 is a UNESCO World Heritage Site. The old Village of Monterosso al Mare is on a hill which offers a splendid panorama. Visitors can see the old castle, the Church of St. John the Baptist and the Capuchin Convent. The modern area has developed in the lower part called Fenigia, with a lovely beach where you can admire the "Giant", a statue of the god Neptune, 14 meters high. 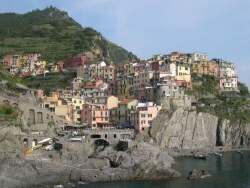 Coming from the town of La Spezia you will reach Riomaggiore, the most visited village of Cinque Terre. From here begins a fascinating walk, dug into the rock of the early twentieth century, leading to Manarola, it is the famous Way of Love. Another route not to be missed is the Blue Trail, which crosses the National Park of Cinque Terre Italy. 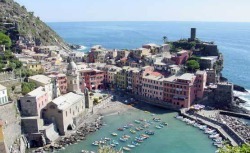 Vernazza is home to a marina confirming its ancient fishing tradition. There are fortifications, decorated portals and porches overlooking narrow streets on steps going down to the port square. nteresting is a visit to the parish church of Santa Maria of Antiochia, the Shrine of Our Lady of Reggio and the Doria Castle. Manarola, perched on a rock overlooking the sea, is one of the best examples of how man has been able to tame this wild and rocky land, build their own houses and creating terraces to be devoted to the cultivation of orchards and vineyards. Unique landscapes can be admired from the promontory of Punta Bonfiglio or the Sanctuary of Our Lady of Health of Volastra. Through a long staircase, perhaps a little hard but very suggestive, you will reach the top of a hill covered with vineyards: here is Corniglia with its land of great wines like the Cinque Terre DOC, the famous Polenza and the Sciacchetra'. At the foot of the promontory, the wonderful sea is lapping the famous Guvano beach, a favorite destination by naturists. 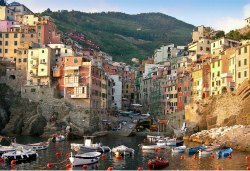 Those who visit the Cinque Terre will be captivated by the beauty of an absolutely pristine sea, but also from the mainland, where a wild nature, with vineyards, olive groves and citrus orchards, testifies how the man was able to tie his life and its traditions to this stretch of coast.